I say, well, we have an exclusive interview with a Friars legend. 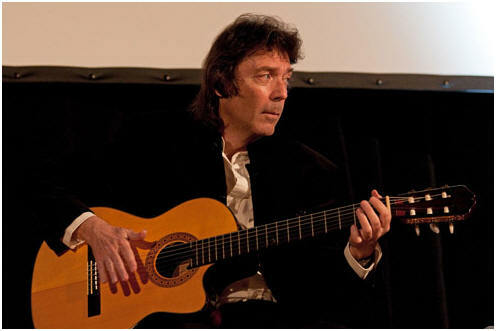 Steve Hackett played Friars Aylesbury three times with the ever growing Genesis and played also with Genesis at Friars gigs in Bedford, Watford and Dunstable. Steve surprised fans when he quit Genesis, by then hugely successful, in 1977 two years after another Friars legend, Peter Gabriel, had left the band. Steve's first big headlining tour as a solo artist was in 1978 and on only a handful of gigs ensured that Aylesbury was one of them. Here, Steve interrupted his current recording sessions to talk about Friars, Genesis, the time when Peter Gabriel broke his leg at Friars, his leaving the band, his own solo career and his thoughts on a 'classic' Genesis reunion. Steve releases a new album "Out of The Tunnel's Mouth" very shortly - check out his website (at the bottom) for more details! Friars Aylesbury Website: Steve, welcome to the Friars Aylesbury website! It's safe to say that Friars holds a special place in your career? Friars was always a great gig to play for me and the rest of the Genesis guys. It always felt like playing in front of friends, almost a family atmosphere. Of course David Stopps was important in spearheading it. Those shows were early victories for us all, affectionately remembered early seventies memories. It's clear from, not only generally speaking, but also from the Chapter and Verse biography that Genesis held David Stopps in very high esteem. What set Friars out amongst the other venues in the early days? David was such a character and really was part of the shows with his top hat and white clothes. I remember Pete Gabriel breaking his leg there. He always gave his all but perhaps that was a bridge too far. There was warmth and enthusiasm from the crowd that acted as a morale booster for the band when other hearts were harder to conquer. You may not know that Genesis played the only ever Friars gig at Princes Risborough in 1970 - do you remember Mike (Rutherford) getting booked for having no tax on the van?! If it was 1970 I can’t confirm. That’s a year before I joined the band, so sadly I can’t confirm the story about the tax running out on the van, but it sounds plausible! You mentioned Peter breaking his leg jumping off of the Friars stage in 1971. How did his flamboyant stage persona sit with the rest of the band as you were developing? This appeared to be the exact opposite of your own unassumed sitting down position in the band? Crowd surfing became part of Pete’s act in later years but no-one was ready for it in those early days and unfortunately the waters parted... Pete did some gigs with us from a wheelchair after that, whilst waving his crutches around wildly, which was admirably stoic! All of Genesis used to sit down apart from Pete. It was a different time when several bands did that, de rigueur for ‘serious’ guitarists to sit down in those days. I still happily sit down when playing nylon! I seem to recall that one idea he (Gabriel) had was for the band to effectively play in front of the PA, obviously oblivious to the horrendous feedback it would probably have caused! I don’t think this got off the ground did it? I have no recollection of the suggestion to play in front of the PA but I did see the Grateful Dead actually doing this. Genesis had outgrown Friars Aylesbury by the end of 1972, how was this time for the band with an ever increasing profile? It was certainly only going to be up! 1973 saw a big difference in our presentation. By then we were carrying our own lights, sound and stage set, which didn’t fit everywhere, plus we were touring other places relentlessly. What caused the tensions that led to Peter leaving? Was it the strong front man presence or was it more, as Peter has alluded to, that as the singer he should be writing all the lyrics and not singing someone else's or writing "by committee" as I think he termed it. Pete had other projects he wanted to pursue and he also needed to spend more time with family for a while. In the meantime the band was keen to keep up visibility. Finances were tight. Family pressures for all of us were difficult as many of us were becoming fathers. I sympathised with Pete’s need to write all the lyrics he was going to sing. I loved him dearly and still do. We all missed him when he left. Whilst you all are friends of longstanding, what was the band's reaction to (Gabriel's first solo single) Solsbury Hill which is widely held as a swipe at his leaving the band? I think Solsbury Hill is a great tune and I played it live with Pete with my own band at a charity concert in Guildford. It has a very nice and memorable twelve string guitar part. Lyrically it’s both very honest and personal. Obviously Pete was ready for change. Whilst looking back, it was obvious that Phil (Collins) was the man, but how near were you to employing a new singer in the band - there were many auditions? Your departure from Genesis marked the end of an era, this was borne out of frustration with many of your ideas not being incorporated? I have to say that the Wind and Wuthering album was a fine swansong, but would have benefitted from Inside and Out particularly being on there over say something like Wot Gorilla? The Voyage of the Acolyte prior to Wind and Wuthering must have shown you a different way of working which you enjoyed more? Wind and Wuthering was a fine album. On the reissue it has the three extra tracks recorded at the time, Inside and Out, Match of the Day and Pigeons, plus we also rehearsed up what later became called Please Don’t Touch. It was a very productive period, but not enough to hold me back from pursuing my own muse. The rest of the band must have been shocked at your leaving? Do you think the collaborative way the band wrote subsequently would have suited your style? We often wrote collaboratively refining jams that became songs but once I had the taste of a solo career I wanted to follow it through. It was difficult to fully express my own ideas within the band, subsuming my own musical identity when I had songs that were crying out to be done. I felt the need to be my own boss and to be free to make my own mistakes like all musos in order to be able to write and play in every style in the book. You presumably felt unshackled from band restraints and obvious compromises? It was good to be free to be myself in so many styles, including Blues and Bach, which have inspired jazzers for years. Music is a constantly inspiring challenge. It was a testimony to Friars reputation and its place in your career that you insisted on one of your dates on your first solo tour (Please Don't Touch) be at Friars in 1978. And it was the biggest stage production ever seen at Friars till that point. What are your memories of that first tour? Presumably the reactions were good and you didn't feel pressured to do Genesis favourites synonymous with you such as Firth of Fifth or the like? I didn’t start playing Firth of Fifth in its entirety until recently as it was so well known and I wanted to carve out my own niche. These days I welcome my old faves particularly if they have a great guitar melody. I want to help everyone to feel they are a kid again. In any band there’s compromise, but whilst I’ve enjoyed my solo projects, I’ve also felt nostalgia for the past. I also think it’s obvious to anyone listening to that first post Genesis album, Please Don’t Touch, that Genesis were going to miss something special. That album is so good and arguably more ‘accessible’ than it’s predecessor Voyage of the Acoylte. Then again How Can I is your Solsbury Hill isn’t it? Please Don’t Touch told everyone that I wasn’t going to stick to format. It was always going to be a trip around the world, particularly by Spectral Mornings, from Hong Kong Harbour to Brighton Pier, as Armando Gallo put it. How Can I was a song that Ritchie Havens made possible because he worked so quickly – a singer’s singer and a lovely guy to work with. Did the more commercial direction Genesis eventually went in surprise or disappoint you? I still liked a lot of what Genesis did, particularly in production terms. Who wouldn’t thrill to Phil’s drum sound? When you co-founded GTR, did you have set parameters to avoid some of the problems that had befell you in Genesis? You must have enjoyed the success though? GTR was tremendously enjoyable, but hard work too. Steve Howe (Yes) was and still is a great player. We had some considerable success with Arista Records led by Clive Davis pulling out all the stops. I have (and still play) the Genesis Revisited album you made with some fine musicians including Genesis drummer Chester Thompson - what prompted you to make this album twenty years after you left the band? Do you feel that your interpretations are what could have been? You appear to feel that way with say especially Los Endos? Or was this approach to Los Endos based on some of the work you did in the early 1980s on albums like Cured and Highly Strung? I approached the Genesis Revisited album in a slightly different way to the approach I would have now, as current technology would make it simpler. Of course live Los Endos is still a great tour de force. I still get a kick out of it. I felt it would be good to both celebrate and add something to the tracks. Do you still feel that your best work solo and Genesis wise is Spectral Mornings and Lamb Lies Down On Broadway? Spectral Mornings remains a favourite. Lamb has its high points, but Selling England By The Pound is still my fave Genesis guitar album. It’s such a rich history that it’s hard to know where to begin. Those who have seen the Genesis Songbook DVD will have seen you showcasing some of your astonishing classical guitar talents - do you feel at home best with the classical side or the rock side, or both? Your Tribute album also showcases some incredible musicianship on the classical acoustic side. I really would recommend anyone to check that album out. I’m glad you like Tribute. I feel that’s a personal triumph and it was a labour of love. I always wanted to pay homage to the great J. S. Bach. Those are my musical roots, where I realised the unaccompanied guitar was capable of great intricacy. Both the classical and the electric fire me up in different ways. I always like to embrace the full spectrum. With regards the 2007 Genesis reunion, you put a brave face on it, but you must have been frustrated that the intended five piece reunion to do The Lamb didn't come off? There are still persistent rumours this will happen. What's your take? Do you feel this will happen? You playing the encore at The Six Of The Best reunion in Milton Keynes in 1982 remains still the only time you've all performed together since 1975. Out of curiosity, what were the legal reasons that prevented that gig being billed as Genesis with Peter Gabriel? Oh, and course you re-recorded the Carpet Crawlers in 1999 with the band for a best of. Milton Keynes was a very happy memory for me. You can see everyone’s obvious joy on stage in the photos. I’ve no idea about the billing, but I flew 3000 miles to be part of the encore. It was great to join them all. I’m sure it’ll happen again sometime if they ask me and everyone else is up for it. In the meantime I’ve got a great band that I’m very happy playing with. Thanks for the interview. Must scramble... guitars are calling! Steve, thanks for your time. This interview and its content are © 2009 Mike O'Connor/www.aylesburyfriars.co.uk and may not be used in whole or in part without permission.